After my trip to Europe in 1978 with only three outfits as suggested by Arthur Frommer, I decided that was too few clothes to travel comfortably. I could not bear to look at them after I returned and gave them away. All the photos looked like I seldom changed my clothes in three weeks. This is how I prepare now. I go to https://www.cdc.gov/ and enter my country of destination in the travel section. The Center for Disease Control gives the most recent travel advisories. If you are going to developing countries, you may need immunizations or medicine for malaria. They may advise that you visit a travel clinic to receive your immunizations and medicines to take with you to treat the most common diseases. Check your passport expiration date. PASSPORT: Check your passport expiration date well before you leave. 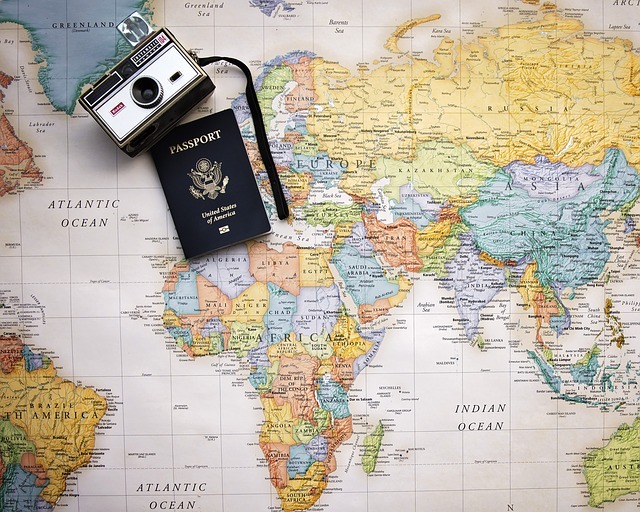 Many countries require a valid passport for six months after your trip. Show your passport to your traveling companion BEFORE you leave for the airport. Make three copies. Leave one at home, give one to your traveling companion, and put one in your carry-on bag. One lady drove five hours to the airport to go on a mission trip and discovered she forgot her passport. She missed the entire trip and lost all the money for her airfare. Expensive mistake. Enter your passport number in your cell phone contact list and the number of the USA embassy of your destination. If I am going to a hilly country, I pack my collapsible LL Bean walking poles which fit perfectly diagonally in the bottom of my checked bag. They worked great in Israel. Others on my tour group wished they brought theirs. Many countries have steps without handrails and only a few elevators. The USA is the most handicap accessible country I have seen. 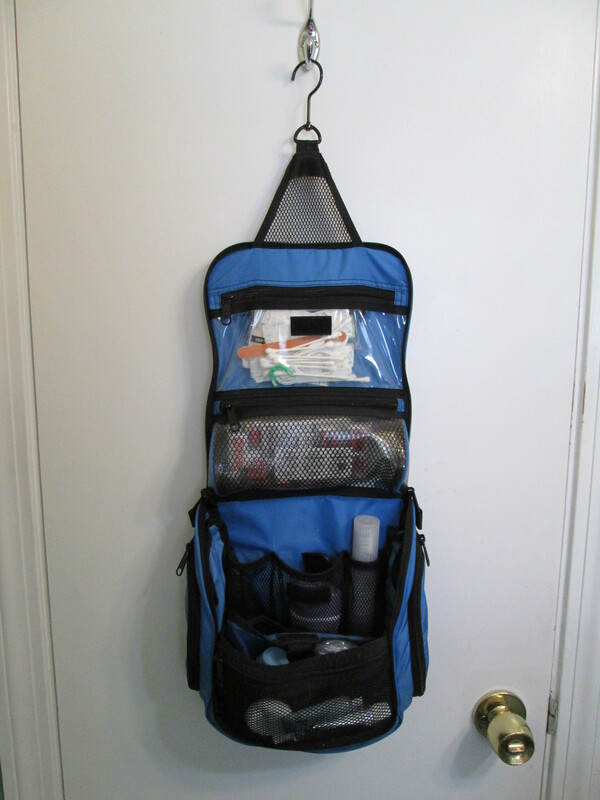 I leave my LL Bean Bathroom bag hanging in my closet packed and ready to go at all times so I only need to throw in a few last minute items. 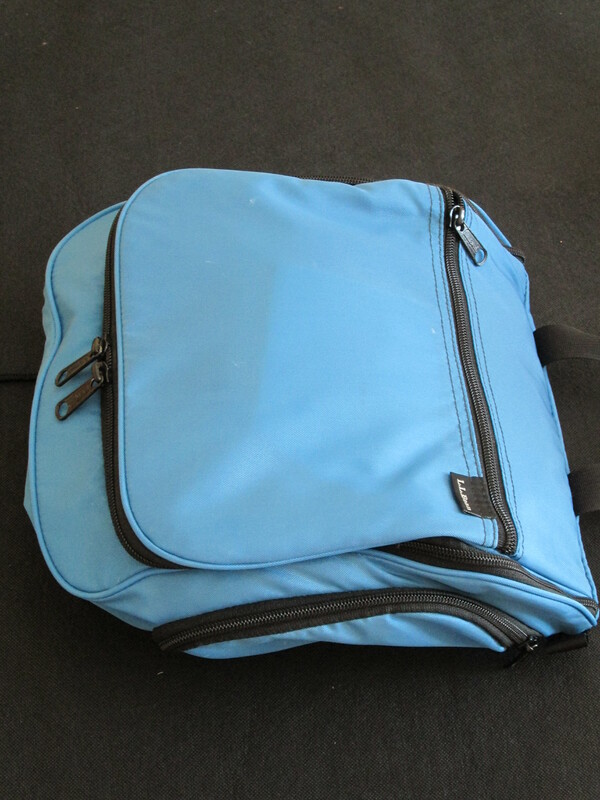 I solely use my bathroom bag the day before I depart to discover anything I have forgotten. Bathroom bag: electronic thermometer, extra foam earplugs, Immodium, chewable Pepto Bismol (prevents traveler’s diarrhea), Charcoal caps (to remove toxins if you get diarrhea), Tylenol, ibuprofen, bacitracin, Qtips, cuticle scissors, tweezers, nail file, band-aids, shampoo, conditioner, small bar soap, Sambucol lozenges (anti-viral cures sore throat if taken first 24 hours), and small sewing kit. 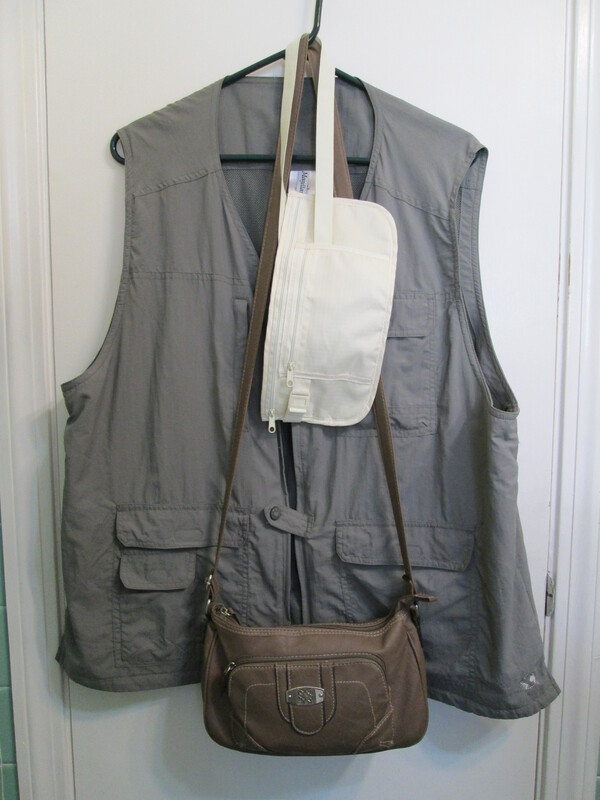 My Magellan travel vest with inside pockets, money belt, and shoulder purse to prevent pickpockets. Purse Items : disposable toothbrush (doesn’t need water & has paste on it), Sea-Bands (prevents motion sickness-CVS), Zofran (by prescription) or Bonine (over the counter) for when the motion is severe, Earplugs on a string so I don’t lose them (Walmart hunting/camping section-$3), gospel tracts in English and the language of my destination country, 2 or 3 teabags. Carry-on bag Items : tablet (great for checking emails and taking videos), Kindle (good for reading-battery lasts longer than the tablet), charging cords, batteries, language phrase book, small Bible, flashlight, 3 pair underwear, 1 or 2 tops, swimsuit (impossible for me to find in another country if my checked bag doesn’t make it), personal medicine, collapsible water pouch ($1 Walmart). After you go through security, fill it at the drinking fountain in the USA to save a few dollars. You can’t do this after you leave the USA because the tap water is not potable. Wear a money belt and take 50 single US dollars in good condition. They are good around the world. Don’t change any money at the airport before you leave the USA since they have terrible exchange rates. Notify your ATM bank and credit card company before you leave or they will shut down your card when you use it overseas because they will think it was stolen. Make copies of the front and back of your cards and store a copy in your carry-on bag. Put the card company phone numbers in your cell phone contact list so you can easily report any theft. Upon arrival at your destination, go to the ATM before you leave the airport and take out enough cash to last you a week. Memorize the exchange rate. (I forgot to do this in Iceland and took out the equivalent of $700 instead of $100.) Your bank will charge you $5-10 every time you use an ATM, so don’t take out small amounts. (Charles Schwab debit card is the exception. They reimburse all international ATM fees.) Stuff the cash in the inside pocket of your travel vest as fast as possible. Lock yourself in the closest restroom stall and put the cash and your passport in your money belt. Only keep about $50 in your wallet or enough to cover the taxi to your hotel. Some people carry a “dummy wallet” with about $20 and an expired gift card to give to a thief if you are accosted. Jet lag prevention: Nothing works very well for me, but this is what the experts say. Set your watch to the new time zone when you board the plane. Eat a healthy dinner at the airport after you go through security. If it’s an overnight flight, skip dinner on the plane, put in your earplugs, throw the blanket over your head, and try to sleep all night. Eat breakfast when they serve it. If you land in the morning, try to stay out in the sun all day to reset your internal body clock and don’t nap. Go to bed at the normal time in the new time zone. Take melatonin or a prescription sleep aide the first couple nights to help you sleep. Your body takes one day to recover for every hour of time change. My best flight with the least amount of jet lag was when I flew all day to England, landed at midnight and went to bed immediately. I’m a very light sleeper, so I only catnap on the plane no matter what I have tried. I envy people who can sleep on a plane. Stay hydrated. You lose one cup of fluid for every hour you fly, so drink one cup of non-carbonated decaf beverage hourly. Do leg exercises and stand up and walk hourly to prevent blood clots. Since I’m high risk for clots, I take a chewable baby aspirin every eight hours of flight and wear Jobst compression knee socks. I walk to the rear of the plane and ask the flight attendant for a glass of water in between their service times. Ask God to bless your trip, use you for His glory and honor, trust in Him, and rest in Him. Smile and say hello in the native language. Enjoy meeting people and making new friends. Jesus Christ is the good shepherd and goes before you. I encourage all young nurses to go on at least one short-term medical mission trip. My trips to Honduras and Belize changed my life by making me thankful for my blessings and helping me pray more effectively for people in other countries.